Even after years of education and training, there are some things that people still mess up. For some, it’s Maths or Chemistry. And for some it’s grammar. Grammar mistakes can happen to anyone. We all make grammar mistakes from time to time. 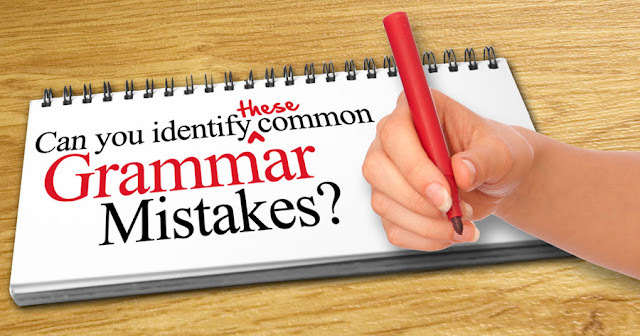 But if someone is preparing for competitive exams like CAT, GRE, GMAT, etc., these grammar mistakes can be fatal for his or her marks in the English Language section of the exam. So, to get rid of these silly grammar mistakes, we are providing some common mistakes that people usually make. Commas are used to separate elements in a series, independent clauses, or introductory word or phrase. Bad placement of a comma can change the meaning of a complete sentence. One of the common mistakes that students usually make is a bad usage of the pronouns, “whom” and “who.” The pronoun “whom” is always an object and the pronoun “who” is always a subject. But still, people say wrong sentences like, “Who did you give the book to?” or “Who should I meet?”. “Its” is the possessive form of it and “It’s” is the contraction of “it is” or “it has.” But still lot of people get confused because “its” has an apostrophe s after it, which normally means something is possessive, but it’s actually a contraction. Most people mix up the words “Lose” and “Loose.” This usually happens because they are spelled similarly, but they have completely different meanings. “Lose” is a verb which means to fail to win a contest or a game, or to be unable to find someone or something. It’s like losing books or losing a cricket match. On the other hand “Loose” is an adjective which means “not tightly attached, fastened or held,” like a loose tooth or loose clothing. Students preparing for competitive exams like CAT Exam should improve their grammar to score well in the exam. We have provided these common grammar mistakes so that students can analyze and correct themselves before appearing for the exam.